Australia-based industrial gear provider David Brown Santasalo will support BAE Systems‘ proposal to produce ships for the country’s future anti-submarine warfare vessel development program. 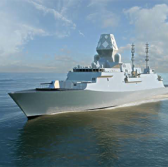 David Brown Santasalo said in a report it has committed to ensure the Australian industry maximizes its involvement for the SEA 5000 Future Frigate program which seeks to develop an in-country industrial capacity for to build, operate and sustain future frigates. Dean Leydecker, a managing director at David Brown Santasalo, said the company will collaborate with BAE Systems to develop a platform that can meet anti-submarine warfare requirements of the country as well as help grow the Australian economy and open job opportunities for local people and businesses. Leydecker added the David Brown Santasalo looks to help BAE Systems offer the Global Combat Ship-Australia platform which will potentially open opportunities for future generations’ local industry development and employment. BAE Systems sent a proposal to manufacture nine anti-submarine warfare vessels in August as part of its bid for the Australian SEA 5000 Future Frigate program.